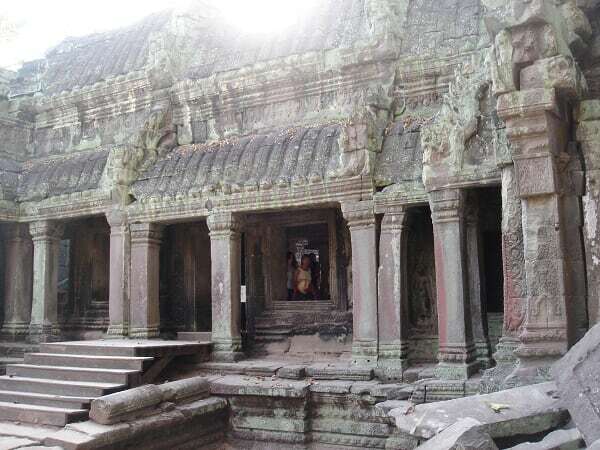 Ta Prohm was built by Jayavarman VII at late 12th century as a university and monastery. The god of wisdom worshiped in the temple, Prajnaparamita, was modeled on the king’s mother. Later, Srindravarman expanded the site until the end of 13th century. 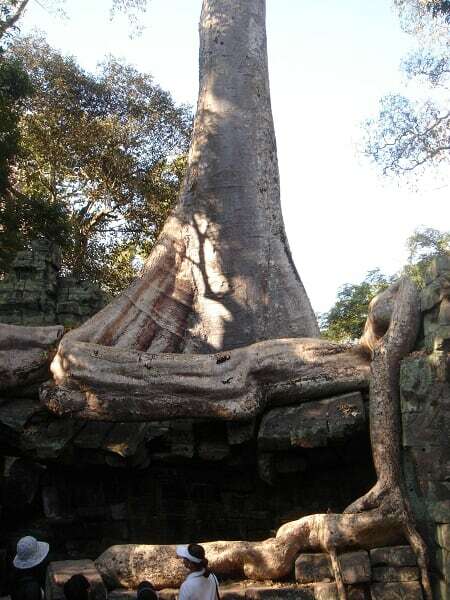 Ta Prohm was unique in that many big trees, known as Kapok, intertwined the site and bestowed it an aged and serene ambience. This is also the background used in many scenes in the movie, Tomb Raider. Ta Prohm was originally built as a Buddhist temple when Jayavarman VII was the king, but it was converted to a Hindu shrine by Jayavarman VIII later on. Therefore, some embossments representing Buddhist features were destroyed. 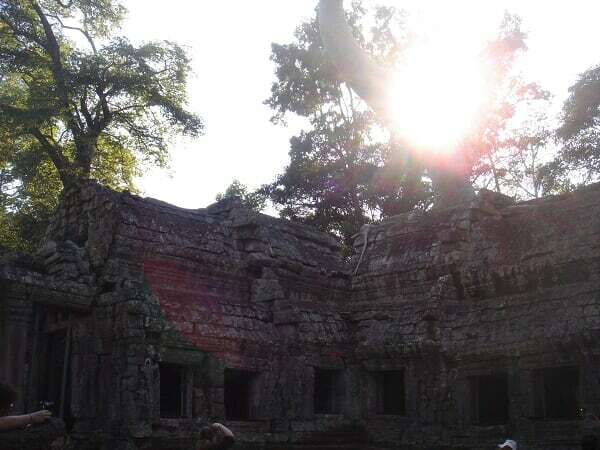 Pardon the big ol’ crane in the background; Ta Prohm is under heavy restoration now. This tower is special because the sound of pounding of chest is echoed. When a person pounds his/her chest in the tower, an echo can be heard surrounding inside it. However, other sounds like talking or clapping are not echoed. 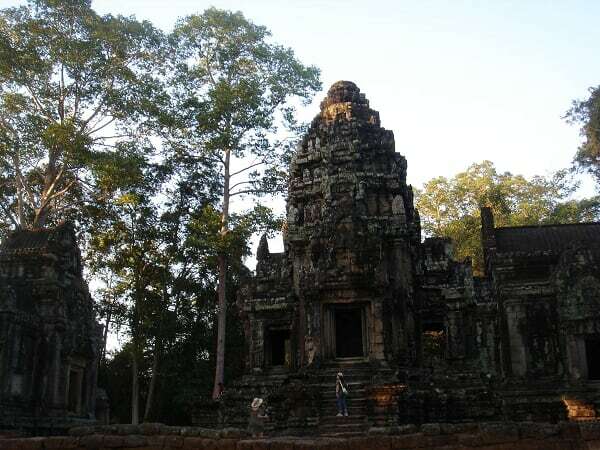 Ta Keo was built by Jayavarman V at 10th century with 5 towers consisting of overlapping terraces on the very top of the 5-layered pyramid to represent Mount Menu–the sacred mountain in Hindu and Buddhist cosmology. Ta Keo is unique in absence of external decorations. Two theories explained the phenomenon–stonemasons found that the stones were too hard to carve the elaborated embossments thus gave up half way through it; but another said that the temple was stricken by the lightning and the people regarded as a bad omen, thus they stopped working on it. The second theory was more accepted since it was a bit implausible. 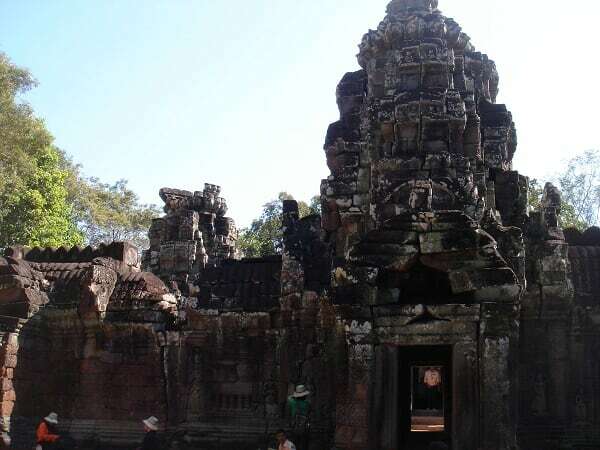 Since the stone carvings were processed so widely in Angkor and it’s unlikely that the stonemasons realized that the stone brought to build this particular temple were too hard to be embossed. Looking down from Ta Keo. 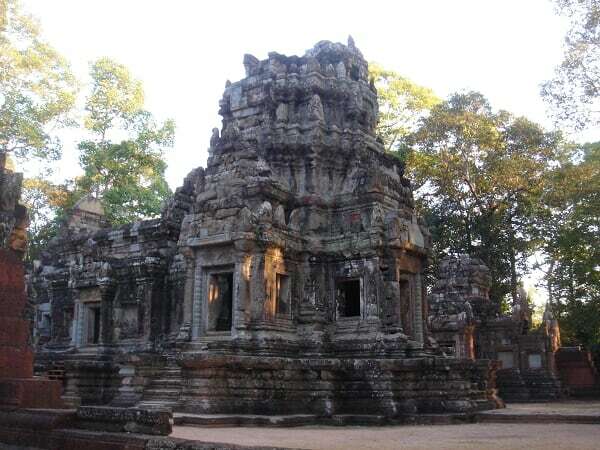 Thommanom was built from 1113 to 1130 by Suryavarman II as a smaller temple for Hindu high gods–Shiva and Vishnu. Some scholars also believed that Thommanom was also used to store scriptures. The temple was built with only one tower on a 2.5-meter tall base. This temple is known for having delicate Hindu goddess carvings on it. 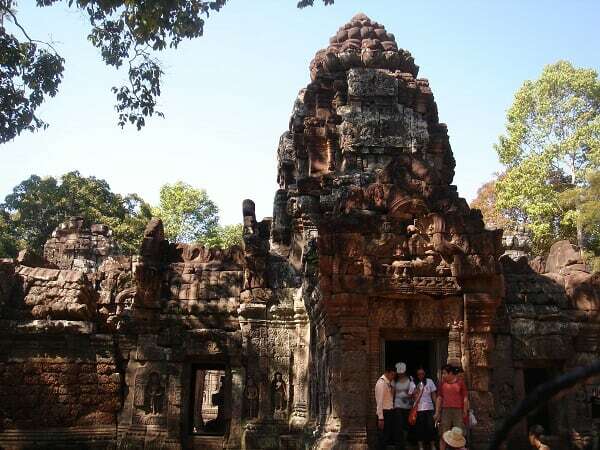 Chau Say Tevoda was built in the mid-12th century by Suryavarman II, and later expanded by Yasovarman II. The temple was heavily damaged and now reconstructed by Chinese archeologists. Chau Say Tevoda is just across the road, now known as Victory Road, from Thommanom. Built in year 1191 by Jayavarman VII as a Buddhist temple for Avalokitesvara, Preah Khan was later converted to a Hindu shrine by Jayavarman VIII. The name means the “holy sword” and it was indeed used to store the king’s sword. 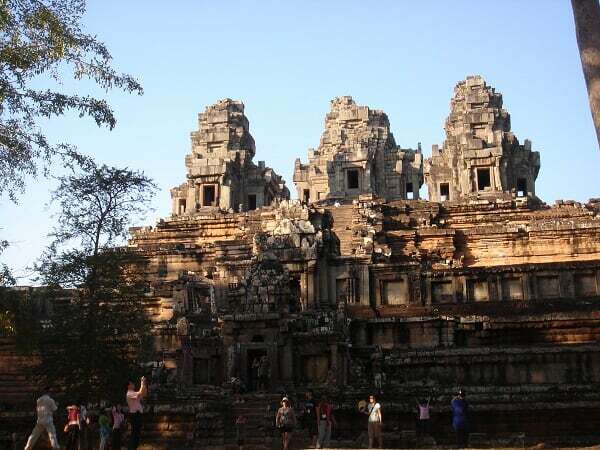 It was built to celebrate the victory of defeating Champa, known as Vietnam now. 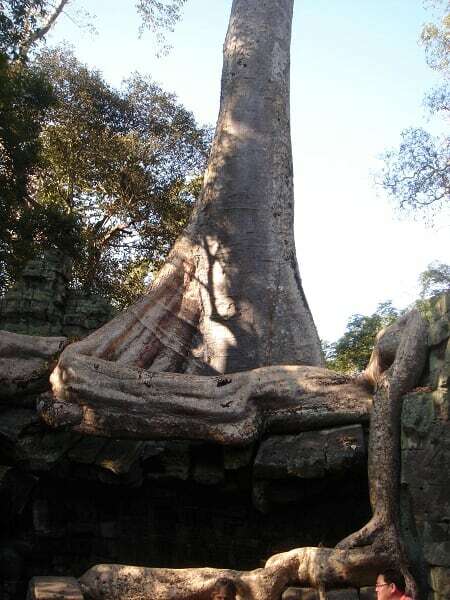 Similar to its counterpart, Ta Prohm, it was used to commemorate the king’s father, and coincidently left un-restored like Ta Prohm for centuries with old trees twirling around the site. 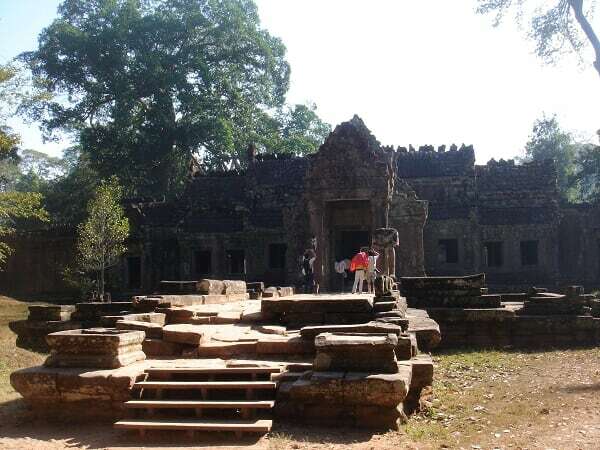 Entrance to Preah Khan. 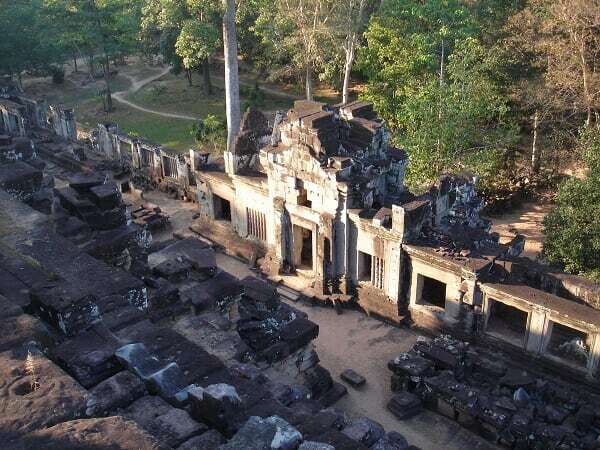 Preah Khan is about 138 acres and enclosed by an 800m-by-700m moat. Same as other temples, the entrance is adorned with “Churning of the Ocean of Milk”–clans of God and Ashura engaging in a tug of war. It’s the 2-story building marked red on the layout. The true purpose of it is still unknown but speculated to be a granary. 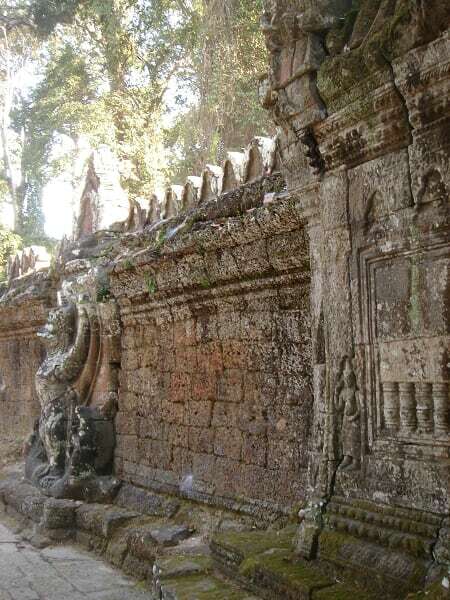 Jayavarman VII built several hospitals during his reign, and one of them was Neak Pean, established in late 12th century. The name was derived from the intertwined snakes on the base of the temple. The temple tower was built on a 14m-diameter circular base “floating” on the pond, symbolizing Anavatapa, which is a lake on Himalayas believed to have the power to cure illness. The herbs were grown around the tower and mixed with the water in the pond. When people came to ask for the medicine, they would be diagnosed and sent to one of the 4 chapels to get the holy water. The north chapel enclosed a stone elephant head, representing “water”; west chapel contained a stone horse head, meaning “wind”; a stone lion head in the south chapel, symbolizing “fire”; and finally a stone human head representing “earth” in the east chapel. The circulating system passed the water in the pond mixed with the herbs out of these stone heads’ mouths, so people could soak or drink the water as they were instructed. 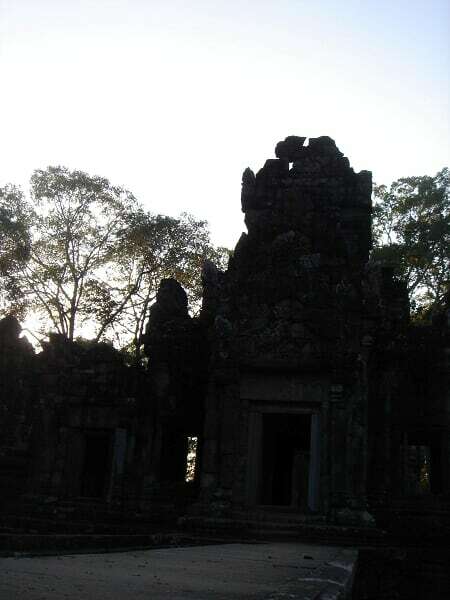 One of the chapels of Neak Pean. 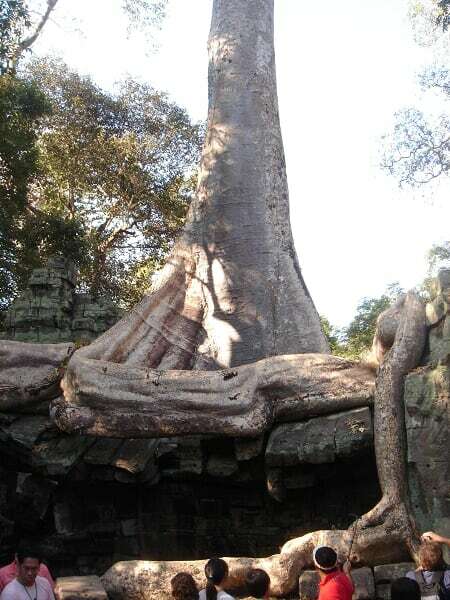 The center temple tower of Neak Pean. Ta Som was built by Jayavarman VII in later 12th century to honor his father, Dharanindravarman II, who was the king from 1150 to 1160. It’s also said the temple was dedicated to his sister. 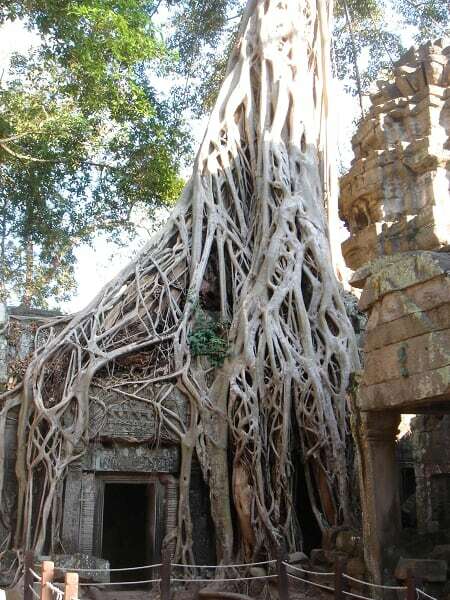 Like Ta Prohm and Preah Khan, Ta Som was also covered by the forests with numerous trees and vegetations grown on the site. East Mebon was built in year 953 during Rajendravarman II’s reign as a Hindu temple dedicated to Shiva. 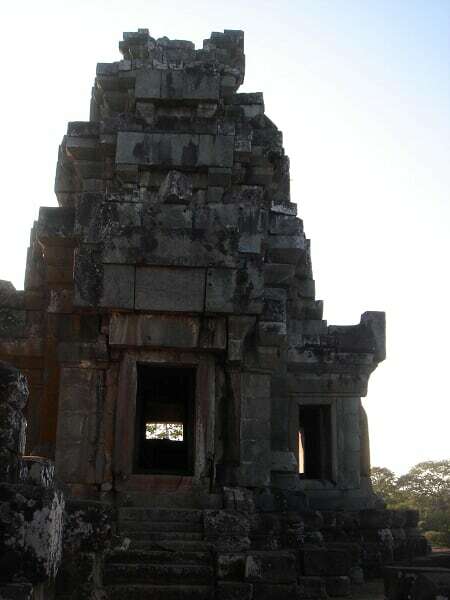 Different from other later temples constructed mainly with stones, East Mebon was composed mostly with bricks. Rajendravarman II built Pre Rup in year 961. Same as East Mebon, also commissioned by Rajendravarman II, Pre Rup was largely built by bricks thus had this unique reddish tone. 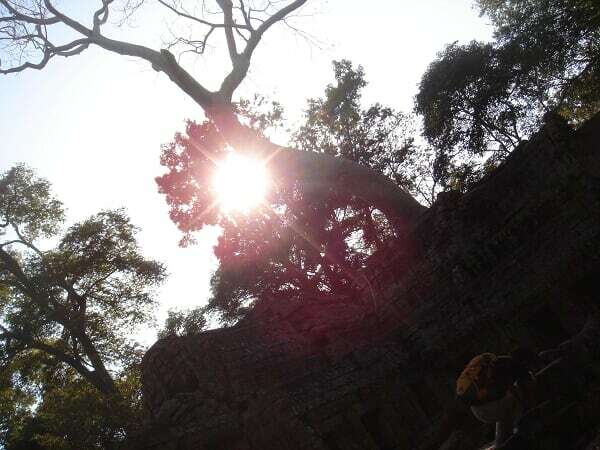 Pre Rup was a Hindu temple dedicated to Shiva; the name translated to modern meaning of “turning the body.” It could be because the legend mentioned the king who went to the top to worship the god and came back looking young and refreshed. However, it was also believed that the temple was used as a funeral site for kings; thus meaning turning the body to ashes or souls leaving the body to become something superior than human beings. Pre Rup was design with a 50-meter square base with three layers of platforms on top of each other, and there were 5 towers built on the very top–4 smaller ones on 4 corners of the platform and a big one in the center. The temple wall built with bricks were difficult to carve since the bricks tended to break when embossed and the embossments would appear as vivid, therefore plasters were patched on the bricks so the walls could be decorated with elaborated carvings of deities. 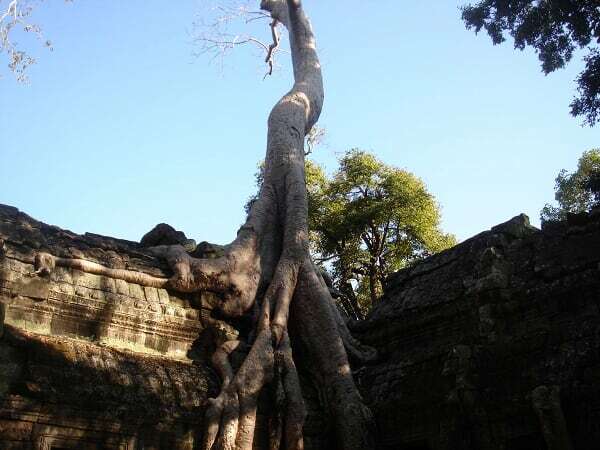 This entry was posted in Cambodia 柬埔寨, Travel 旅遊. Bookmark the permalink.